Apiol (4-allyl-3,6-dimethoxy-l,2-methylenedihydroxy benzene), C12H1404, is a constituent of parsley seed oil and of Venezuelan camphorwood oil and matico oil from which it congeals upon cooling. Apiol has been examined more particularly by v. Gerichten,2) Ginsberg,3) Ciamician and Silber,4) and Thorns.3) The complicated constitution of this substance was almost completely revealed by Ciamician and Silber, but the final questions involved in establishing the above structural formula were settled by Thorns. 1) Power and Salway, Journ. chem. Soc. 91 (1907), 2055. 2) Berl. Berichte 9 (1876), 258, 1477. 3) Ibidem 21 (1888), 1192, 2514; 23 (1890), 323. 4) Ibidem 21 (1888), 913, 1621; 22 (1889), 2481; 23 (1890), 2283. 5) Ibidem 3G (1903), 1714. C6Br(02CH2)(OCH3)2C3H5Br2, m. p. 88 to 89°. 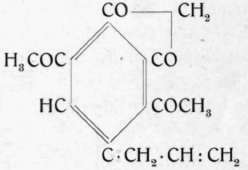 Oxidation converts it into apiol aldehyde and apiolic acid (see below). Isoapiol, which results from the action of alcoholic potassa on apiol, crystallizes in monoclinic crystals which melt at 55 to 56°. Three bromine derivatives are known, a monobromide, m. p. 51°, a dibromide, m. p. 75°, and a tribromide, m. p. 120°. Like apiol, isoapiol yields, upon oxidation with potassium permanganate, apiol aldehyde, C10H10O5, m. p. 102°, and apiolic acid, C10H10O6, m. p. 175°. Both phenol ethers also react with nitrous acid.